You can make this stylish silk flower centerpiece in just a few easy, simple steps with these FREE ONLINE photo-illustrated, step-by-step instructions. 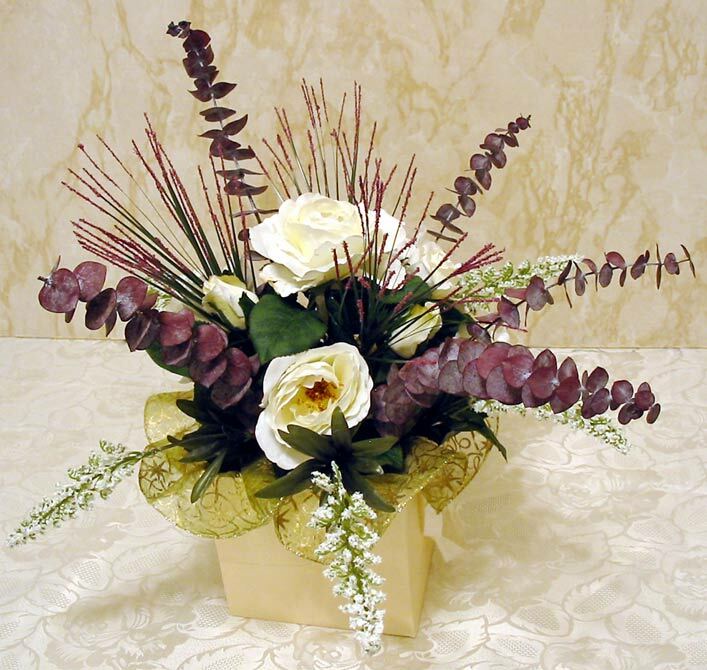 There are also tips on special artificial flower manufacturing details to look for that can make your own silk floral arrangements look more lifelike and natural. Knowing these special details, you can buy the best quality, most realistic silk flowers and artificial floral products for your money. Even if you are a newcomer to silk floral arranging, here's a fast way to get started without becoming confused or overwhelmed. If you are looking for a quick, uncomplicated do-it-yourself silk flower centerpiece idea, this artificial flower table arrangement is EASY and ECONOMICAL to make. There are ONLY FIVE STEPS to making this chic silk floral design! The number of components used here are minimal, in order to be as economical and simple as possible but still create a very pleasing silk flower centerpiece. 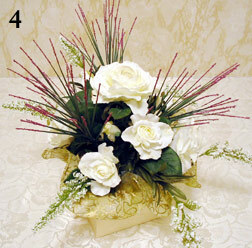 And of course, you can substitute your own choice of container, silk flower stems and colors as desired. By all means, if you want to use more stems to make a fuller bouquet, go right ahead! closer inspection in a new window. Below are pictures of the products used in the making of this silk reception table arrangement, with tips about the special manufacturing details to look for that can add a more realistic presence to any silk flower centerpiece. 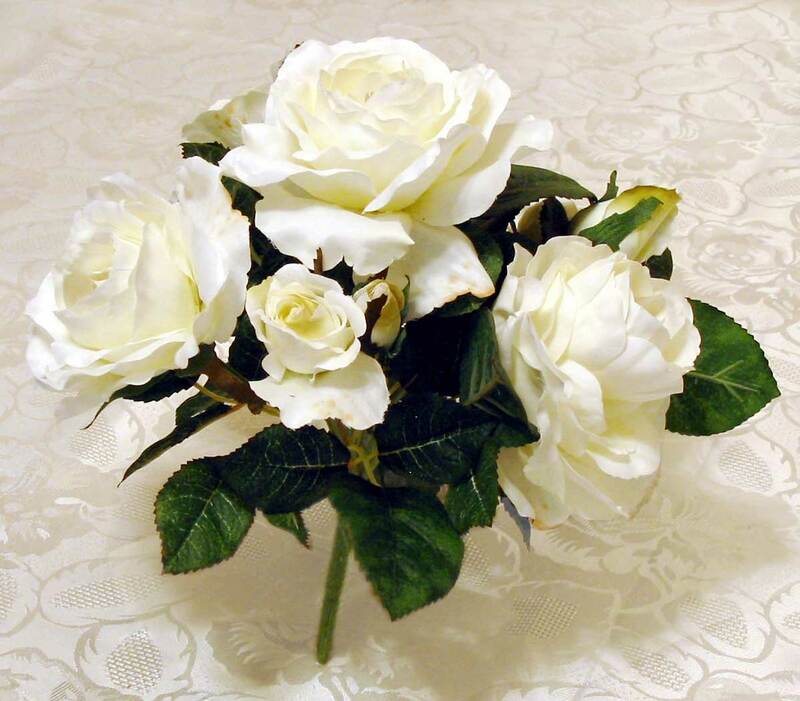 This is an excellent example of a good quality, very natural-looking white Rose silk floral bush, of approximately ten inches diameter. It has ten Rose blossoms in various stages, from bud to palm-sized full bloom. 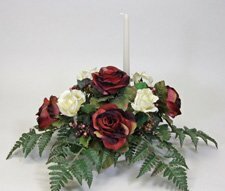 What special manufacturing details make this attractive pre-made Rose bouquet so lifelike? Click on the picture for a closer look. You can see a slight discoloration on the edges of some Rose petals. Also, notice the foliage detail — the leaf texture, the fine tracery of veins, the realistic leaf edges which also show some browning. It's details like these that can fool the eye, and make this artificial pre-made Rose bouquet a real winner! TIP: With some ribbon and bead or pearl accents, this quality silk Rose floral bush could make a fine wedding throw bouquet. 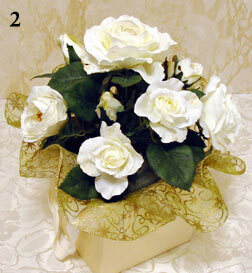 Or, it could serve as an excellent, almost ready-made starting point for making your own silk Rose bridal bouquet. 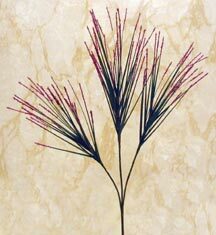 Click on the pictures below for a close-up look at the blossom parts of these silk flower stems. (Foxglove left, Meadow Wisp right). 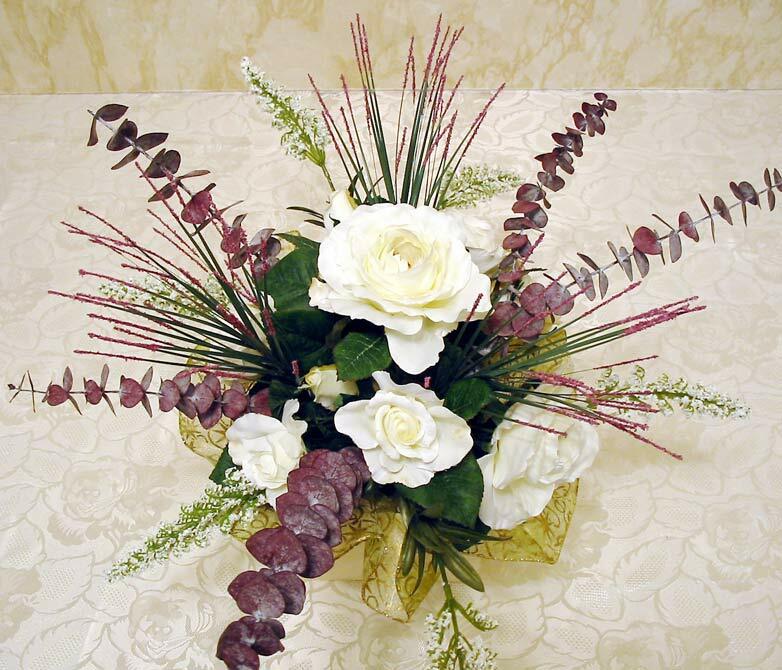 The realistic texture heightens the authenticity and visual interest of this simple silk flower centerpiece. Natural Eucalyptus is available in a wide range of color shades. 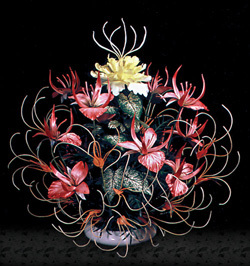 One way this is achieved is by soaking the stems in a bucket of dye-colored water, which is then absorbed upward throughout the branch and leaves. The color may fade as weeks pass and the Eucalyptus dries out. The number of stems in a package can vary, averaging about 10-12 per bag. Check for broken tips before purchasing. Note: The minty scent of natural Eucalyptus can be disagreeable to some people. Scent-free, artificial Eucalyptus is available, but in a limited color range — usually shades of rusty red or mossy green. 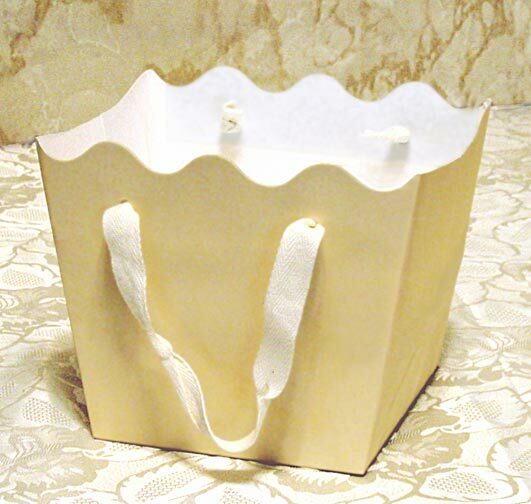 Not quite cardboard, this heavyweight paper ‘basket’ is foldable and fairly durable but can tear if handled carelessly. This container is approximately 7 inches high x 8 inches wide at the top. 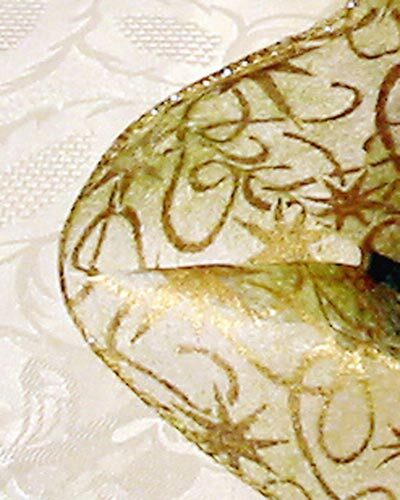 Notice that the top edges have an artistic scalloped design on two sides. The woven fabric side handles are an interesting accent. Although rarely considered as a floral display container, a sturdy paper-based receptacle may be a good, 'cheap' alternative to plastic or glass containers. 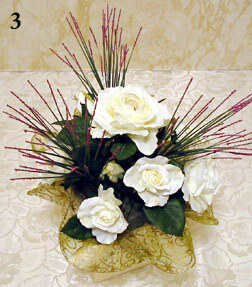 In this case, it imparts a casual note to this silk flower centerpiece design. What do you think? Here's something different and unusual in a silk flower centerpiece! A gold and green transparent gauze skirt dresses the container, and adds festive flair and a pinch of sparkling glamor to this simple silk flower arrangement, without stealing the show. It is approximately 15 inches in diameter. Styrofoam bricks, blocks and sheets come in different thicknesses and sizes, in either green or white color. Depending on what you find available, and what type of container you use, you will have to estimate how much to buy. Use a metal knife with serrated blade to trim as needed. A steak or butter knife is fine. 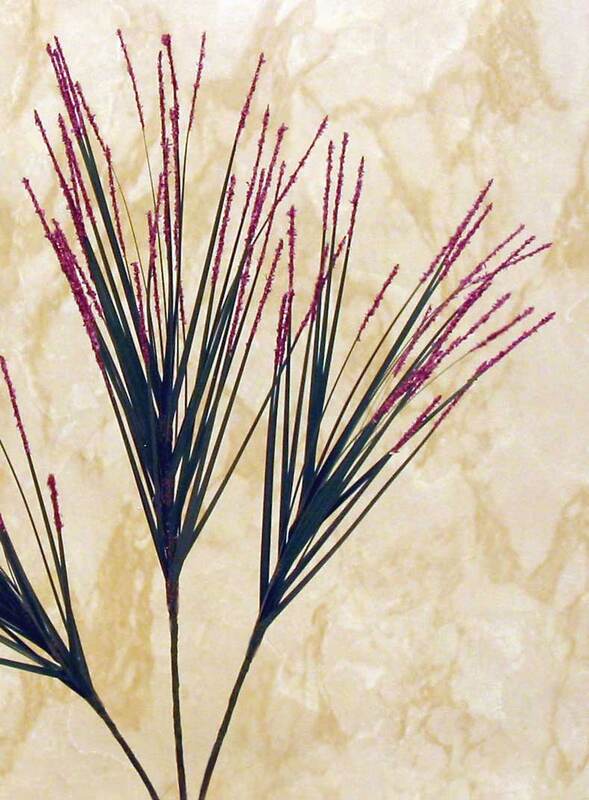 To trim silk flower stems. A hot glue gun was used to secure the styrofoam blocks, but any type of glue that is safe to use with styrofoam, with good bonding properties, can be used instead. 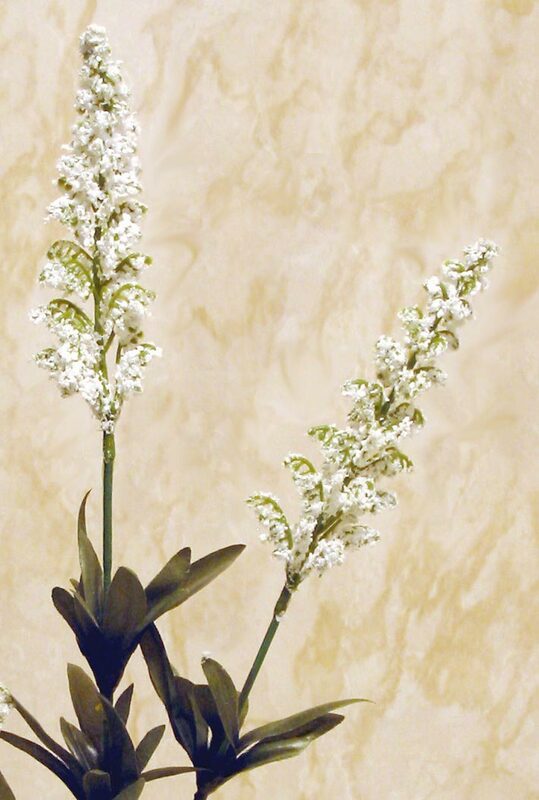 Glue will not be required for bonding anything else, unless you wish to make a more durable arrangement by putting a touch of glue on the ends of stems before inserting them into the styrofoam. NOW, Let's Make This Silk Flower Centerpiece! I'm sure you realize that a sturdy foundation is very important for every floral arrangement. A firmly secured, well-anchored base is an absolute must for optimal support, especially during transport. If you prefer to use a vase, bowl or woven basket container instead, you can leave out the doily skirt and skip Step 1 below. 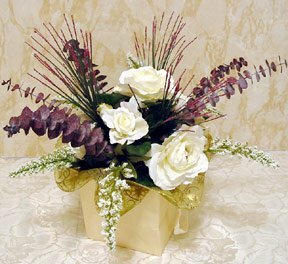 Instead, visit this article for tips, ideas and detailed instructions on choosing and preparing a container for a silk floral arrangement. So, are you ready? Let's do it! For this silk flower centerpiece design, the deep container required three pieces of styrofoam squares to set the silk Rose floral bush at proper height. Best height is when bottom foliage slightly touches and overhangs the container rim. Depending on the size and thickness of the styrofoam (blocks, bricks, thick or thin sheets) you purchase, you may need to use more or less. First, trim the bottom two styrofoam blocks to fit almost touching the inside container walls. 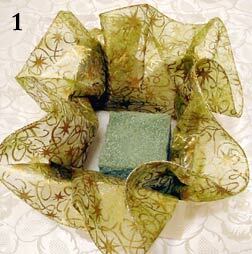 This will help to minimize wobble and movement during transportation of the completed silk flower centerpiece. Glue the first block to the container bottom. 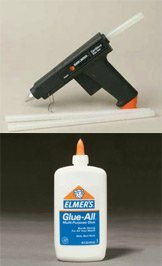 You don't need a lot of glue — a spiral or zigzag squirt over a large area will do fine. Next, you'll need to experiment with placing the doily into the container, centering and shaping it to make fairly uniform ruffles all around. This may require some fussing and patience. When you are satisfied that the ruffled edges extend pretty evenly on all sides, only THEN apply glue to the second piece of styrofoam and press it firmly on top of the doily. Hold for several seconds. The glue will seep through the gauze and bond with the styrofoam underneath. Finally, if needed for more height, glue a third styrofoam block in place. This top block can be smaller than the others. This allows us to insert stems into the SIDE surfaces of the block, too. This smaller block will also be better hidden and less visible under the foliage. Note: Since the Rose bush has a lot of leaves that give good coverage, moss was not used to hide the styrofoam beneath. If you want to, you may do so at this point. 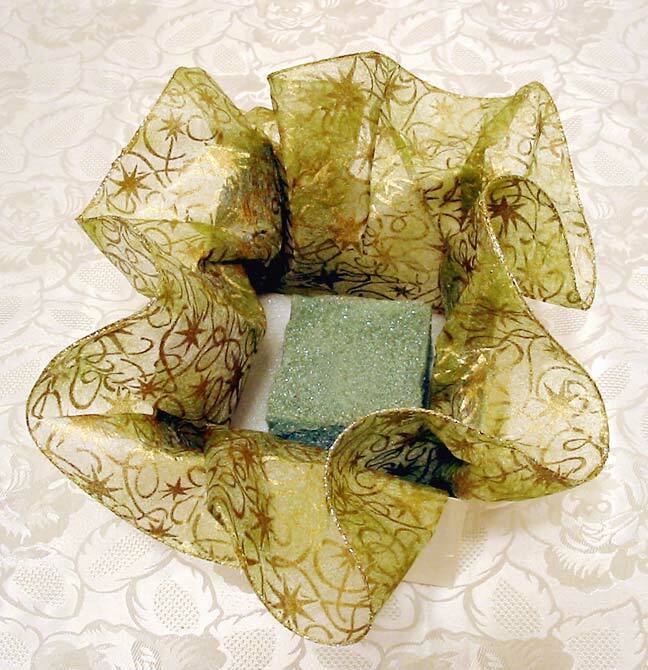 OK, now that you have prepared a container, we are ready to make the silk flower centerpiece! Just look at the pictures (click on each picture for a large view in a new window) and follow the step by step instructions. You'll be done in no time! 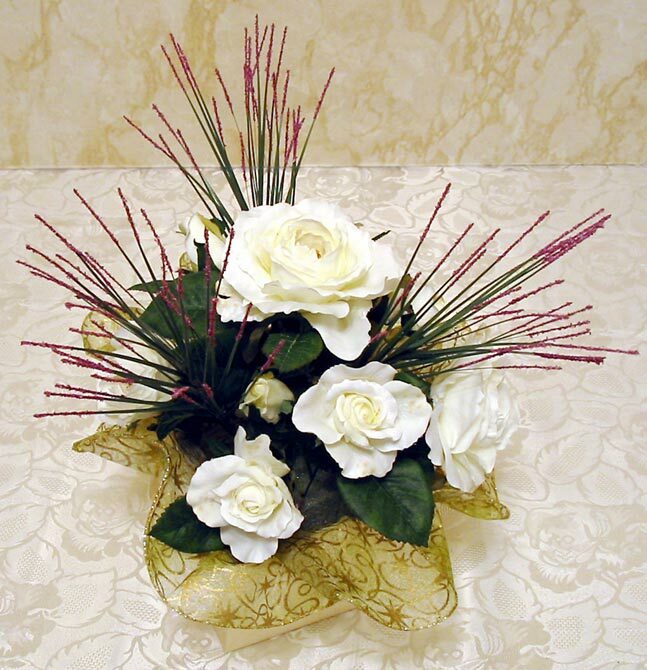 Spread apart and shape the Rose floral bush stems as best you can. Insert in the center, pushing the stem at least one to two inches into the styrofoam. 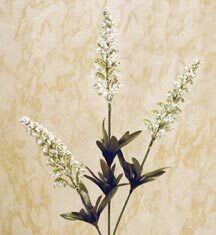 Measure and cut so Meadow Wisp blossoms extend about 3 inches beyond the Rose bush. Position the 3 blossoms in a triangle pattern at about a 70 degree angle around the central Rose blossom. The Meadow Wisps I used were constructed of three wire stems hand-wrapped together with floral tape by the manufacturer to create one unit. I removed the tape and separated them so I could better place the parts individually. You can leave as one piece if desired. Insert main stem near center of Rose bush, but you will need to manipulate the 3 blossoms into triangle position among the Roses and foliage. 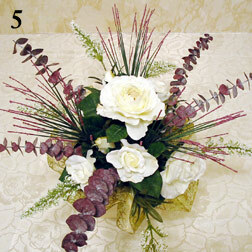 Insert a Foxglove stem on opposite sides at bottom of the silk flower centerpiece. Unlike the meadow Wisps, these were manufactured as three wired plastic stems connected to one main molded plastic stem. I inserted as one piece and spread the three wired stems far apart, extending well out and shaped to curve downward. Select 5 branches of Eucalyptus. Measure lengths so branches extend several inches beyond the Rose bush shape, a little further than the meadow Wisps. Vary the lengths a bit. Remove any leaves from stem base so there is at least 2 inches of bare branch to insert into the styrofoam. 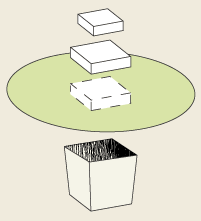 Place in positions of your choice at varying angles (for example, from 40 to 60 degrees). That's it — we're done! 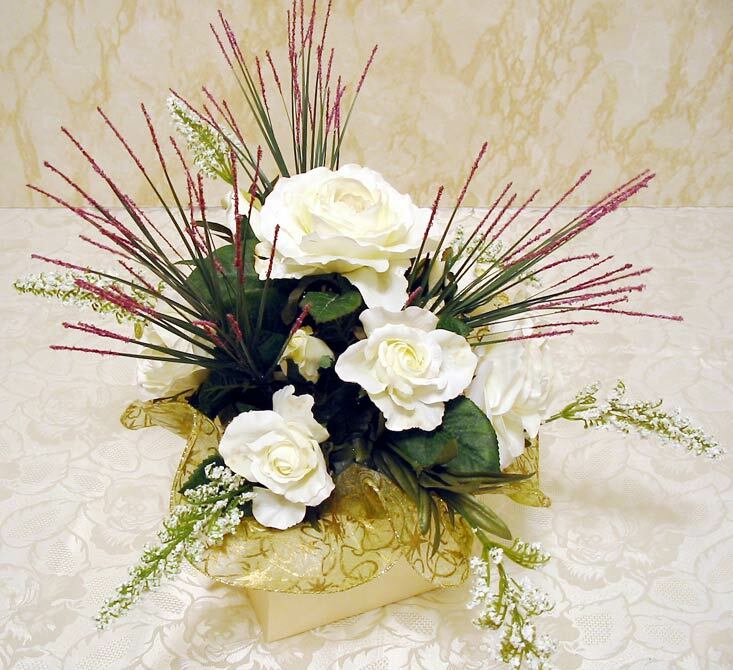 Step back and admire your simple, classy silk flower centerpiece table arrangement. And practice accepting nice compliments on your work! There are no rules when it comes to exercising your own creativity. 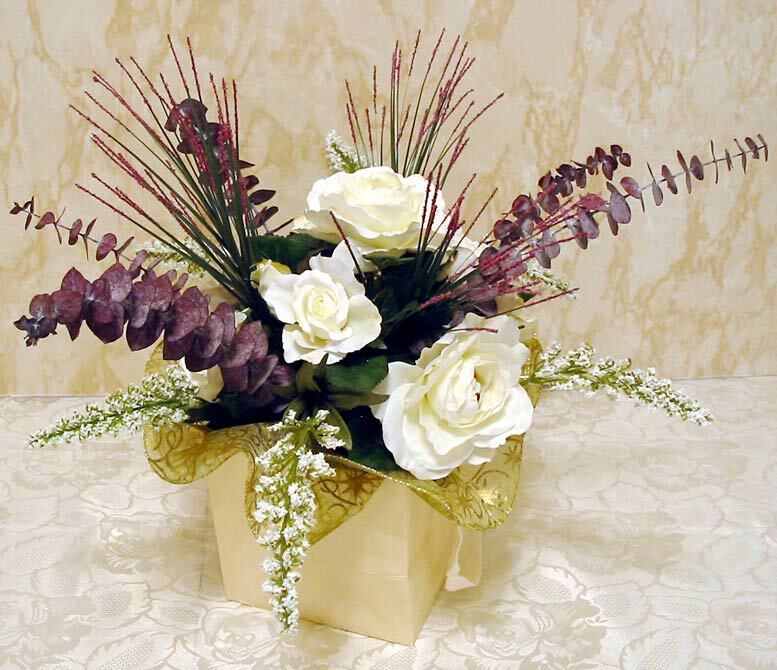 For instance, the cardboard container used in this silk flower centerpiece is, to me, an unusual choice. 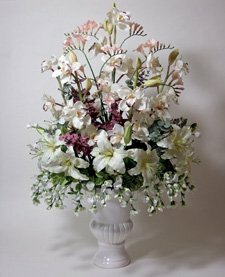 The generally accepted 'rule' for pleasing results is that the height of a floral arrangement should be at least 1.5x to 2x the height of the container. 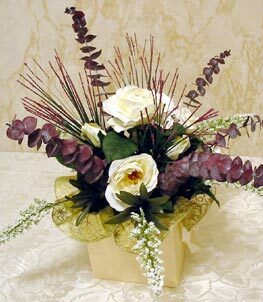 Here, the container is somewhat oversized and boxy, and is almost the same height as the floral assembly extending above. And the doily skirt is an idea I had never considered as part of a floral centerpiece. But it adds an understated dash of glamor to offset the plain cardboard container. All in all, we made 14 of these moderately priced, medium-sized silk flower centerpiece arrangements, which received many compliments throughout the Engagement celebration. Bravo, girls! 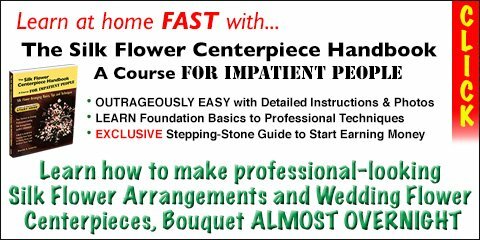 Check out The Silk Flower Centerpiece Handbook: A Course FOR IMPATIENT PEOPLE — you'll be glad you did! If you need some help with a floral color scheme, visit this easy guide to spectacular color combination ideas. If you want more wedding flower decoration suggestions and tips, visit this article on easy silk wedding flower ideas. More FREE Silk Flower Centerpiece Coaching!